Two years ago I called my friend Amanda and asked her what kind of sauce one should make when using a fancy ravioli? She promptly responded, “Brown Butter!”. 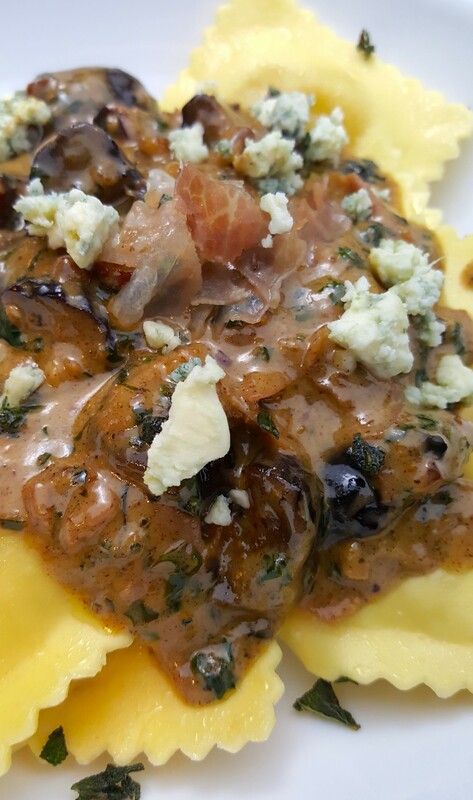 The ravioli I had on hand at the time was stuffed with gorgonzola cheese and figs and her brown butter suggestion was just perfect! 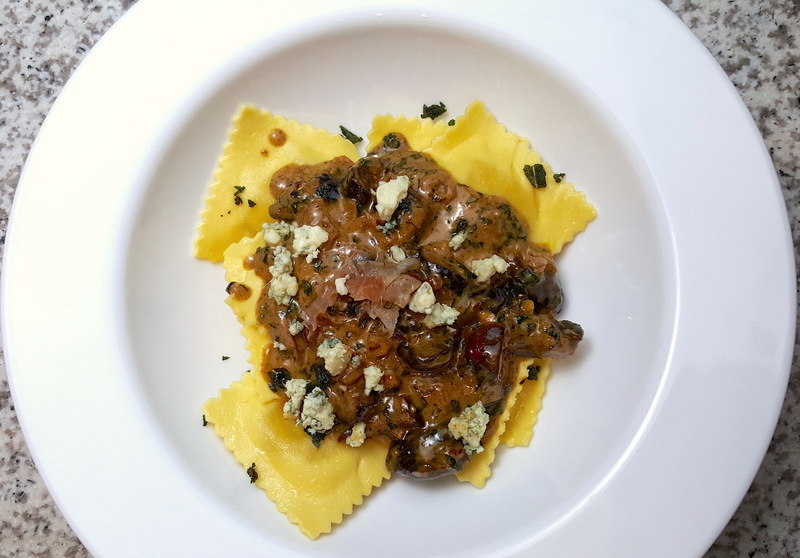 Fast forward to January 2019 when I was back in the kitchen, but this time it was with butternut squash ravioli, and again contemplating what kind of sauce to make? 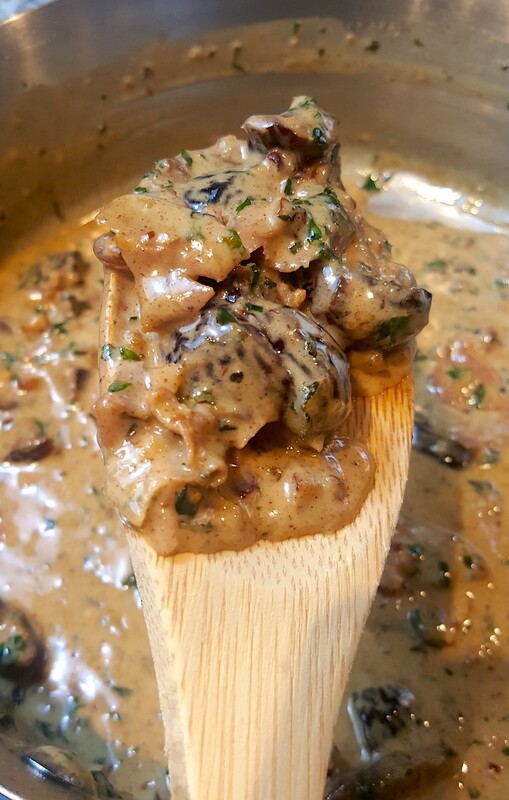 I went to Google and after researching and combining my favorite aspects and creations of Brown Butter Sauce, came up with my new favorite go-to, “Fancy Ravioli Sauce”! The figs are soft and sweet, the prosciutto is crispy and salty, mixed into a brown butter pecan sauce filled with fresh herbs, and topped with gorgonzola; the creaminess, salty and sweet combos explode like fireworks on your tongue! 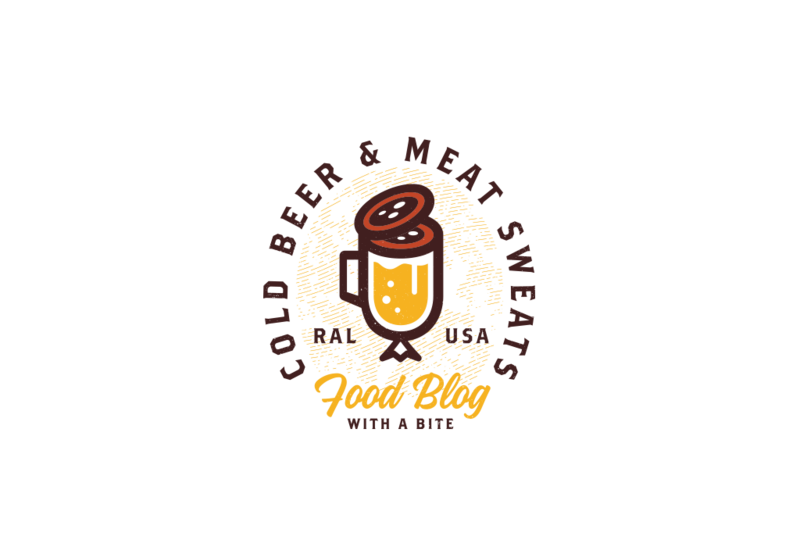 I look forward to your feedback, so please get to cooking and let me know what you think of my new creation! 1. 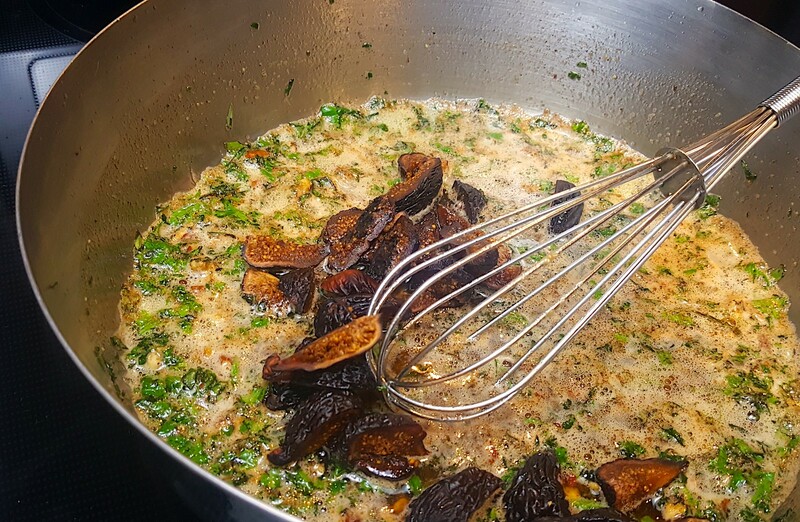 Chop all herbs, and the figs, and measure out all of the other needed ingredients. 2. Crisp the sliced Prosciutto on medium heat, in a medium deep saute pan w/ a tiny drizzle of EVOO. After a few minutes, flip each piece using tongs to crisp up both sides. When cooked to your liking, remove them to a paper towel lined plate. 3. Add in the chopped Sage to the same pan and cook until crispy using a wooden spoon to scrape up bits from the bottom of the pan. When sage becomes crispy, remove them to that same paper towel lined plate. Note: May have to add another drizzle of EVOO if sage is sticking too much. 4. To the same pan, add in 1 stick of butter and let it melt completely without touching or stirring. 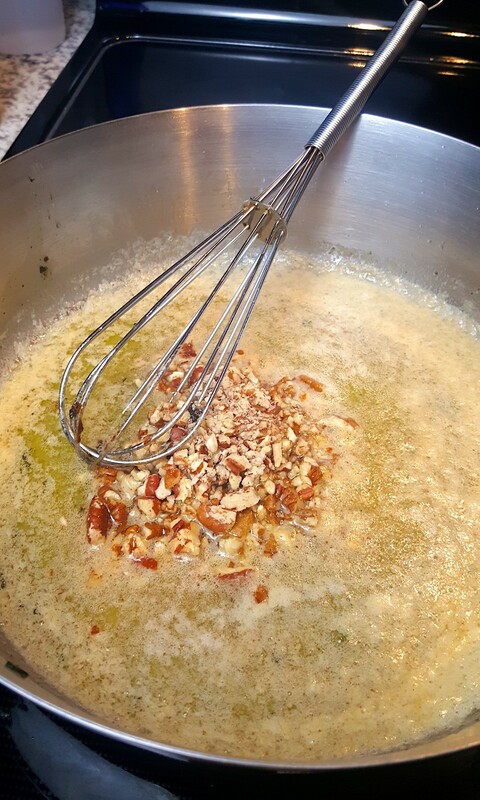 4A) Add the pecans to the butter and whisk well. This is when the sauce will start to turn brown in color. 4B) Start boiling your Ravioli water, salt the water accordingly, and when ready, carefully drop in the raviolis and try not to splash hot water everywhere. The raviolis are done when they have all floated to the top. Drain in sink and return to pot with a drizzle of EVOO, this prevents them from sticking together. Keep pan on very low while the sauce finishes. 5. Once the sauce is brown, add in the chopped tarragon and parsley, and half of the crispy sage. 6. Add in the figs, lemon juice, and cream and whisk slowly. 6A) Chop the crispy Prosciutto and add half into the sauce, reserving the rest for toppings. Whisk the sauce, taste, adjust seasoning to your liking. 7. 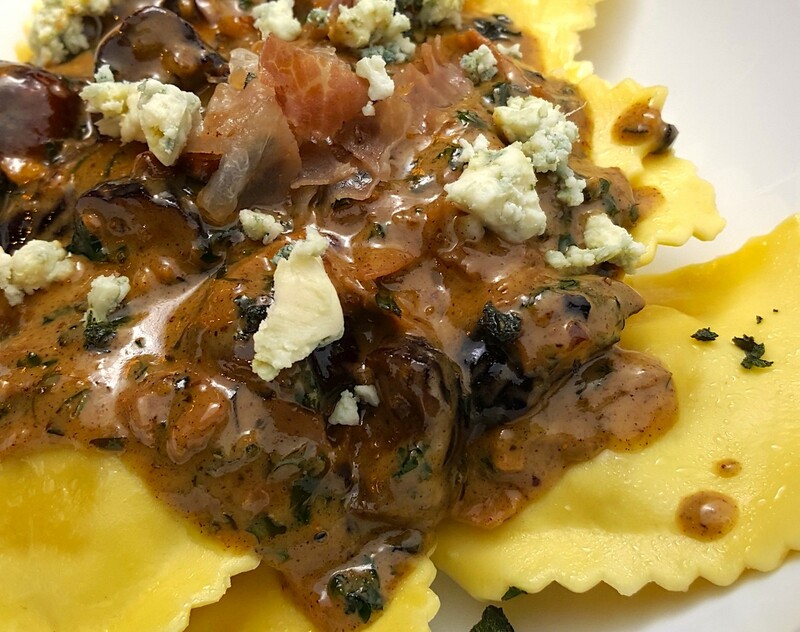 Plate ravioli in a pasta bowl, cover with brown butter pecan and fig sauce, garnish with crispy sage and prosciutto, sprinkle with crumbled gorgonzola cheese and enjoy! 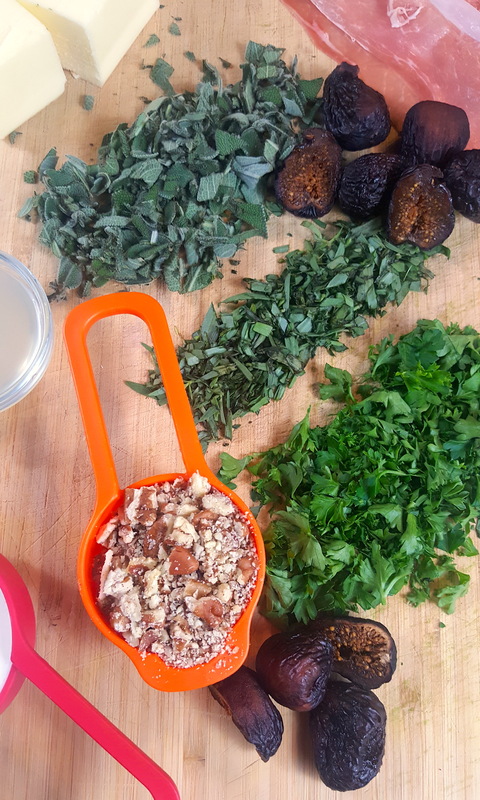 1) Chop all herbs, and the figs, and measure out all of the other needed ingredients. 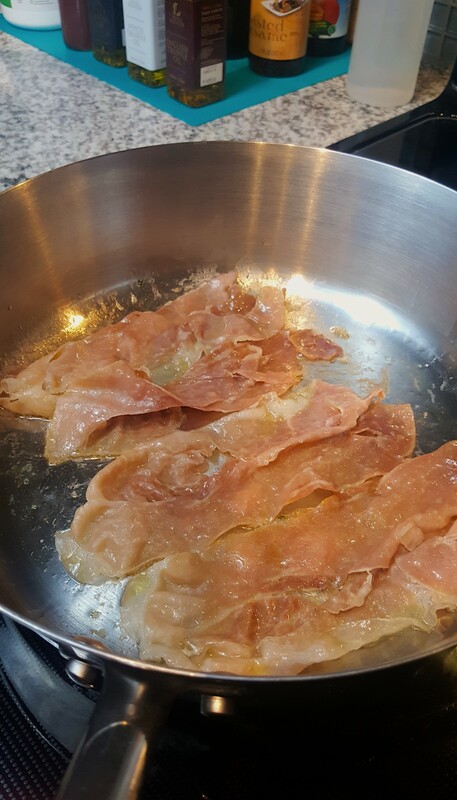 2) Crisp the sliced Prosciutto on medium heat, in a medium deep saute pan w/ a tiny drizzle of EVOO. After a few minutes, flip each piece using tongs to crisp up both sides. When cooked to your liking, remove them to a paper towel lined plate. 3) Add in the chopped Sage to the same pan and cook until crispy using a wooden spoon to scrape up bits from the bottom of the pan. When sage becomes crispy, remove them to that same paper towel lined plate. 4) To the same pan, add in 1 stick of butter and let it melt completely without touching or stirring. 4A) Add the pecans to the butter and whisk well. This is then the sauce will start to turn brown in color. 5) Once the sauce is brown, add in the chopped tarragon and parsley, and half of the crispy sage. 6) Add in the figs, lemon juice, and cream and whisk slowly. 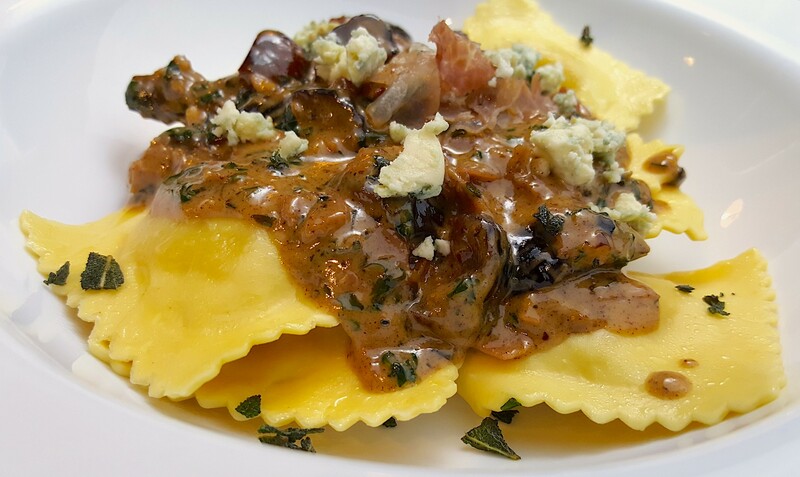 7) Plate ravioli in a pasta bowl, cover with brown butter pecan and fig sauce, garnish with crispy sage and prosciutto, sprinkle with crumbled gorgonzola cheese and enjoy!